As summer draws to a close, and fall ramps up, we look forward to sunny days with a slight bite in the air. There isn't a better time of year to spend in the wilderness, especially the Canadian wilderness, and there is no past-time more Canadian than a paddle in a canoe. After all, before the railroad, the canoe was the transportation method of choice around much of the country, and the Hudson Bay Company, which was founded in the fur trade and is the oldest commercial corporation in North America, used canoes in the early days to get their products from the traps to the heads of the wealthy in Europe. 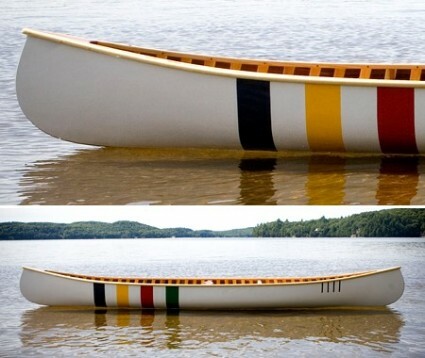 It then only makes sense that the best canoe company in Canada, which actually means the world, was approached to make a cedar strip canoe in the company's iconic multi-strip pattern. If we were to be heading out into the woods for a quiet paddle, this would be the weapon of choice. Langford Canoe makes a plethora of models to suit every need, even an ultra-lightweight kevlar model. You can see them all here.